World Bank Announces ‘Mission Billion Challenge’ Winners! 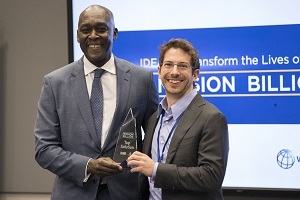 Makhtar Diop, World Bank Vice President for Infrastructure, announced that the winner of Mission Billion was Simprints, for its open source toolkit that uses audio messages during registration to help people provide meaningful informed consent and to understand how their data is going to be used. Second place was Solid, which uses existing World Wide Web Technology to build a decentralized digital ID and data storage platform. And tied for third place was Blockcerts, which is an open standard that empowers people with control over sharing and verifying their documents and credentials, and Sthan, which replaces postal addresses with a privacy-protecting reimagination of what it means to physically locate a person or place. Read press release in English, French and Spanish. 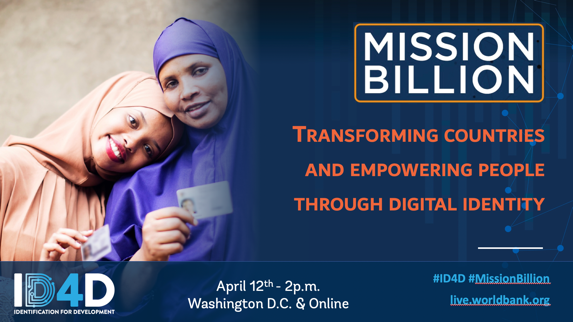 For the inaugural Mission Billion Challenge, the ID4D Initiative started with an issue at the heart of digital identification design: privacy and user empowerment of their identification. See event information. Providing greater oversight and control of personal data. Solutions that enable individuals to inspect, update and correct personal data; provide transparency regarding who has accessed their data and for what purpose; and the ability to seek redress for unauthorized use. Preventing the misuse of personal data. Solutions that can help protect an individual’s personal data from misuse or unintended disclosure, such as through minimizing, hiding, compartmentalizing personal data, tamper proof logs, or other means. We are looking for creative ideas, components, the innovative use of existing technologies or complete solutions from academics, entrepreneurs, scientists, technologists, and engaged citizens. Read blog post. The inaugural Mission Billion Challenge is powered by the MIT Solve platform, an initiative of the Massachusetts Institute of Technology, that uses open innovation and crowdsourcing to solve global challenges. Through this MIT Solve platform, innovators and organizations, participants were able to submit a solution to the Mission Billion Challenge. Submissions will be evaluated by committees formed of staff members of the World Bank and partner organizations. The final evaluation panel will be composed of globally recognized experts in the field of digital identification systems. For more information or questions about the ID4D Mission Billion Challenge, contact us at missionbillionhelp@solve.mit.edu.